Primary care physicians have known this for decades; our siloed behavioral health system is not up to the task. By 2020, we’ll spend close to a quarter trillion dollars(!) on behavioral health; yet enormous gaps in care remain. Sixty percent of people with a diagnosable behavioral health condition are receiving no care or inadequate care. As a result primary care has become the de-facto behavioral health system, and one in need of transformation and support. Evidence shows that “usual care” for mental health diagnosis, like depression, in primary care often result in poor outcomes for patients and dissatisfaction amongst primary care providers. Uncontrolled behavioral health conditions cause a 2-3 fold increase in overall healthcare costs when they are co-occurring with chronic conditions. The ability to implement a systemic care model within primary care for these patients can dramatically alter care and outcomes, a model that includes talk treatment, medication management, and integrated chronic care management. The ability to manage and control behavioral health conditions can assist providers in controlling costs. Collaborative Care is a systemic approach for the identification and treatment of depression and anxiety in a primary care setting. Collaborative Care has been shown to be effective over 80 randomized controlled trials and is now recognized by Medicare and multiple state Medicaid programs for reimbursement. Collaborative Care (sometimes called IMPACT care) was pioneered by a group of clinicians at the University of Washington, who were focused on building a stronger behavioral foundation for the medical home. Universal Screening: Every year, patients should be given tools such as the PHQ9 (depression), GAD7 (anxiety), and AUDT (alcohol), with that screening positive being enrolled in Collaborative Care. Warm Hand-Offs: No more outside referrals. Instead, the PCP has a Care Manager as part of the practice who they can introduce immediately (either down the hallways or a phone call in the next 24 hours) — usually with a social working or nursing background. Regular Behavioral Health Care Management: The Care Manager regularly reaches out to the patient, multiple times a month, to re-assess symptom severity (using the same screening scale), and conducting evidenced-based talk-therapy interventions such as Problem Solving Therapy, Behavioral Activation, or Motivational Interviewing. Registry Review & Curbside Consults: The final part of the model is to have the Behavioral Care Manager spend an hour a week reviewing the panel with a Psychiatric Consultant (Psychiatrist or Psych-NP). The registry acts as an efficient way to efficiently review each patient, their symptom severity over time, current goals or therapy & current medications. 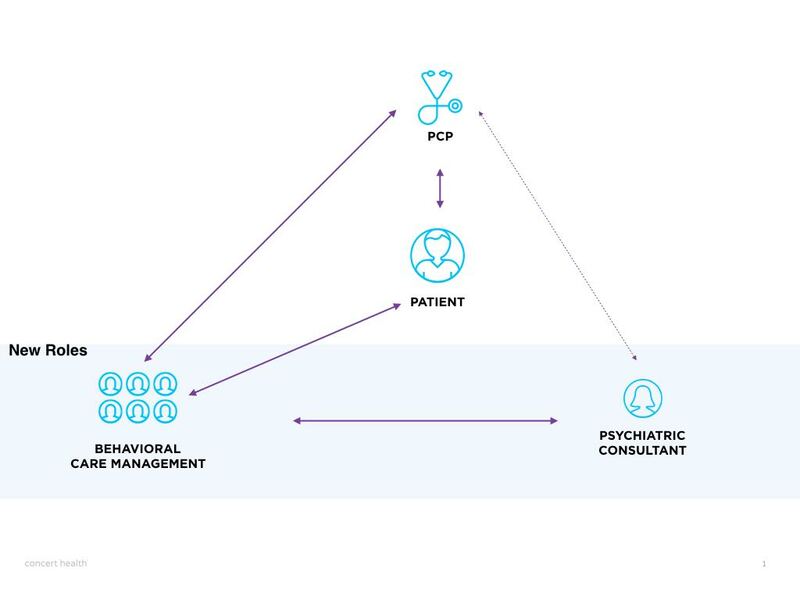 Together, the team can set goals for care, and the Psychiatric Consultant can make medication recommendations directly into the Physician’s chart. In addition to the registry time, the Psychiatric Consultant is available to the primary care office for curbside consults to review the recommendations or help provide guidance around. 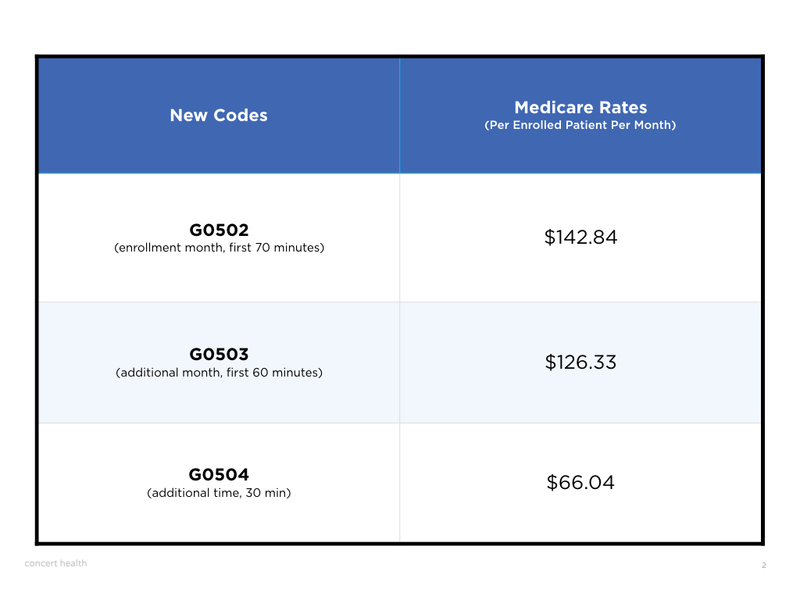 Starting January 2017, Medicare has created 3 new billing codes to support physician practices who are interested in this care model. Dubbed Collaborative Care Care Management (CoCM) — Medicare’s new program will reimburse practices on a Per Enrolled Patient Per Month, assuming the criteria outlined above are met. You can learn more about the codes with this nice FAQ CMS published. Many practices, particularly large groups, may have the team, capabilities, and bandwidth to deliver this program themselves. Concert Health is designed for those practices that are interested in Collaborative Care, but don’t have the ability or resources. Concert provides the remote specialist clinicians (care managers and psychiatrists), and technology infrastructure to help physician practices deliver Collaborative Care Management (CoCM) and take advantage of Medicare’s new program. Primary care practices partnering with Concert Health have the ability to benefit from evidenced based behavioral health care for their patients as well as the financial benefits of the new Medicare billing codes. Virna & Spencer are co-founders of Concert Health, Inc. If you’d like to learn more about CoCM or Concert Health services, you can contact them at www.concerthealth.io.